Tuesday's aren't on my posting schedule but today is a different kind of day, for it marks the sixth month since Cocoa passed. 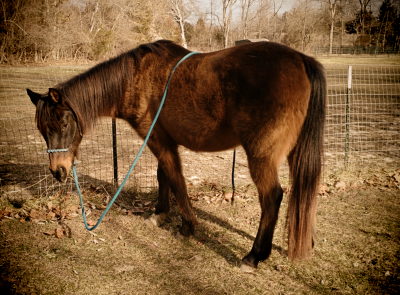 So I thought I would share a bit (a lot) about the horse who was a part of my life for almost twenty years. Obviously the rest of him looked good too! The funniest part was that it was also the first Christmas that I didn't put horse at the top of my wish list. Of course it was the year that I got one! I did pay for most of him but my parents were great in paying the rest. The day after Christmas we got woken up at 7 a.m. by the neighbor knocking on the door asking if we owned a brown horse and a black horse. We knew the brown horse had to be Sheeba, my mom's senior mare that didn't act her age, and so we figured the black horse must be Cocoa, even though he really is a dark bay. So we got dressed and bundled up to go out and get lead ropes. This also allowed us to see how they got out. Sheeba would never leave her boundaries even if a gate was down (this had been proven by accident). Well, Cocoa obviously decided since we had secured the gate he had taken to get to the feed room, he needed to make his own by going through the ones that were dividing the cow barn in half So he could visit Sheeba. It was then easy to follow their tracks through the snow, down the hill, and through the back gate that had been left open. We continued over the fields, to the road, and down the road to the neighbor's house. By the tracks in the snow we could tell that they had themselves a gay old time. That was the last time he broke out that winter since we finally got everything Cocoa-proofed. Cocoa-proofed is a term we ended up using since if there was a way out, Cocoa would find it. He was a very intelligent and curious horse which meant if he got bored he would amuse himself. He was also very friendly and food motivated. A couple of winters ago my husband took me to see Cocoa (he lived in Missouri by this point). We took him for a walk down the road, like you would a dog, and as we were walking my husband put his hand in his coat pocket, a crinkle was heard. Cocoa instantly zeroed in on that noise. I told the husband he better share. Finally he did and thus started Cocoa's love affair with oatmeal cream pies which he only would get when my husband would accompany me. 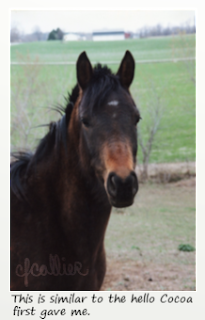 There is so much I could write about the horse that stole my heart but that would be a very long post indeed. I feel what I have shared doesn't do his character justice. So I'll leave you with the Facebook post, wrote a couple days after he died. 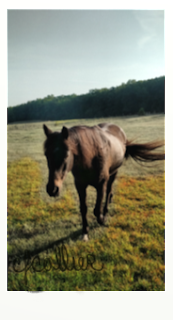 As of about 5pm Sunday my beloved horse, Cocoa, is gone. It was a shock yet for me expected at the same time. He wasn't bouncing back but was doing good. Something just wasn't right and I didn't have my normal optimism about it all. The best thing the vet can surmise is that colic was the cause. She used a different name for the specific type that was probably the cause but I don't remember it. She also said that it could've been a fatty tumor that caused a blockage also and when he was so bad a few weeks ago that could've set off a chain reaction. He was in a lot of pain and his gums were purple so there was nothing she could do for him except help the pain end. I am thankful that my prayer was answered in that I didn't have to make the call. The vet did. I am grateful that God gave me these last few weeks to spend a lot of time with my boy. I don't have any regrets. He knows he was well loved. I even saw him Sunday morning when he was looking happy and good. I am already missing him. We were together almost 20 years. We went through a lot together but we had eyes only for each other. He will always be my true love as far as horses are concerned and I won't stop loving him. He touched so many people with his sweet personality. He truly was awesome (at least to me) and a once in a lifetime guy. God blessed me greatly by giving me the privilege of knowing Cocoa. He was buried yesterday afternoon/evening. I am so thankful for that answer to prayer as well and thankful to Barb for letting him be buried there. I am glad I don't have to worry about him being in pain. X-rays had been taken last Thursday of his front feet in preparation for shoes. He had some rotation in the coffin bone. The getting better had seemed to plateau with both his feet and energy. I will feel the pain of losing him and not having him to hug, pet, and kiss for a long time but knowing he's in peace is gratifying. It's just those of us who are left behind. My husband has been great support through all of this and also feels Cocoa's loss. I am so thankful for him. As I sat and petted his body Sunday I prayed to God that Cocoa would be waiting there to greet me in heaven. I got this distinct impression of God answering, "He will be." Wow, girl, you have a gift for writing! You bring Cocoa back to live with your stories and I'm left behind sniffing. The love between a woman and her horse radiates from the screen. Beautiful. I'm surprised you found my blog with it being so new! Also touched you read!